Not all types of temperature changes in a solid continuum result in creation of thermal stresses. 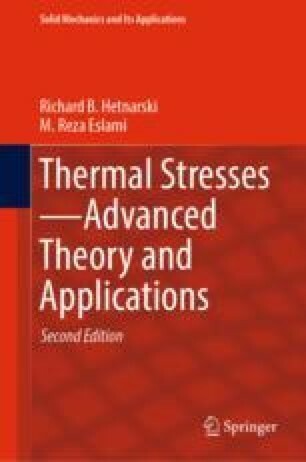 The chapter begins with the discussion of the condition on what type of temperature distribution causes thermal stresses. The analogy of temperature gradient with body forces is stated. Then the theoretical analysis of thermal stress problems is presented in three main classical coordinate systems, that is, the rectangular Cartesian coordinates, the cylindrical coordinates, and the spherical coordinates. In discussing the analytical methods of solution, the Airy stress function, Boussinesq function, the displacement potential, the Michell function, and the Papkovich functions are defined and the general solution in three-coordinate systems are given in terms of these functions.